Freshii, a fresh-food-focused restaurant chain, opened its newest location at 1001 Woodward in downtown Detroit this week. The 1,100-square-foot space, just off the lobby with seating for 24, provides vegetarian-based breakfast and lunch choices. In addition to fresh-pressed juices, menu items include green wraps, salads, and quinoa bowls, with the option to add protein — chicken, steak, shrimp, tofu, or falafel. Menu boards face the hallway, inviting customers to watch their food being made by one of Freshii’s 12 employees, Dickow says. Since opening its first location in Toronto in 2005, Freshii has expanded to more than 60 cities in 12 countries. This is Michigan’s third Freshii establishment, with the others in Grand Rapids and Wayne State University’s food court. Unique to this Freshii is its partnership with local coffee company Ashe Supply Co. The mobile coffee bar is parked outside the restaurant from 7:30-10:30 a.m. Monday-Friday. Another thing that sets the downtown Freshii location apart is the decor of the building, which features 20-foot-high ceilings and marble pillars and floors. 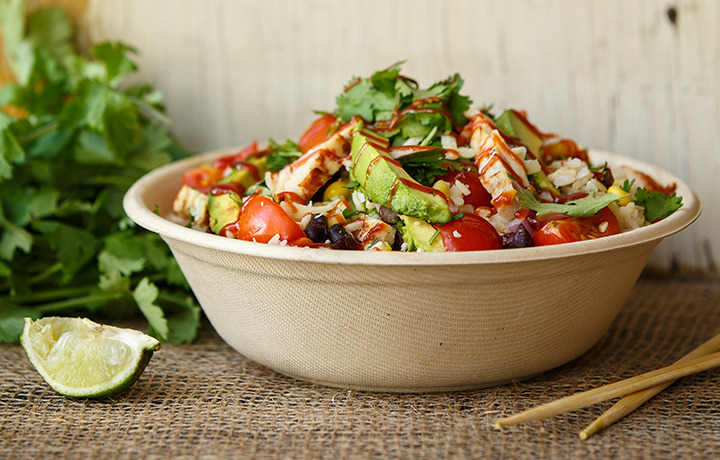 Dickow hopes to open another Freshii, but says he needs to find the perfect location. Because his first Freshii is in the heart of the city, he hopes that the location will build brand awareness, allowing him to open in areas where there might not be such high-density traffic. “It’s an unbelievable feeling to bring this to the city that’s been doing so well,” Dickow says. For more information, visit freshii.com.